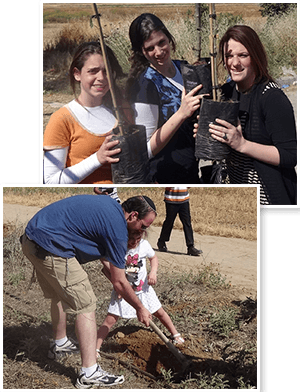 Plant Fruit Trees in Israel Today! A Great Way to Join the People of Israel in Celebrating the Holy Festivals! PLANT TREES OF LIFE – BE INSCRIBED IN THE BOOK OF LIFE! Don’t delay – Order Your Fruit Trees Today! Plant Fruit Trees for the Jewish New Year and Holy Festivals! OVER 20 KINDS OF FRUIT TREES WILL BE PLANTED! Apples, Apricots, Almonds, Dates, Figs, Pears, Plums, Pomegranates and so much more! a Happy and Sweet New Year. making the Land of Israel fruitful and abundant! Show your love for Israel by joining in this wonderful mitzvah! 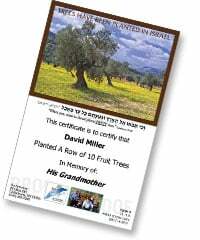 Everyone who participates by planting fruit trees in Israel will receive an Authentic Tree Certificate. Dedicate fruit trees in honor or memory of loved ones. PLANTING FRUIT TREES WITH ZO ARTZEINU IS TAX DEDUCTIBLE IN THE USA! Plant 4 Trees and Get a FREE ‘Star of David’ Necklace from Israel. Order Today! with the sand and soil of the Holy Land! and get the Land of Israel Necklace PLUS a Sterling Silver Tree Necklace, hand-crafted in Jerusalem! and receive both necklaces PLUS a stunning metal rose sculpture created from rockets that landed in Israel!